Patrick Schilling is a typical NC State student. On Saturday, May 12, he will enter PNC Arena with thousands of other NC State graduating students to receive a Bachelor of Science degree in business administration. Like many of his fellow graduates, Patrick will wear his Wolfpack Red regalia and listen intently to speakers including Marian Wright Edelman, Chancellor Woodson, and several others. Then, Patrick will stand up and address eighteen thousand people as the spring 2018 student commencement speaker. Patrick is a typically extraordinary NC State student. While he does share the diverse background, commitment to excellence, and desire to collaborate like many of his fellow 2018 NC State graduates, there is no other person here quite like Patrick Schilling, and he fits right in because of it. 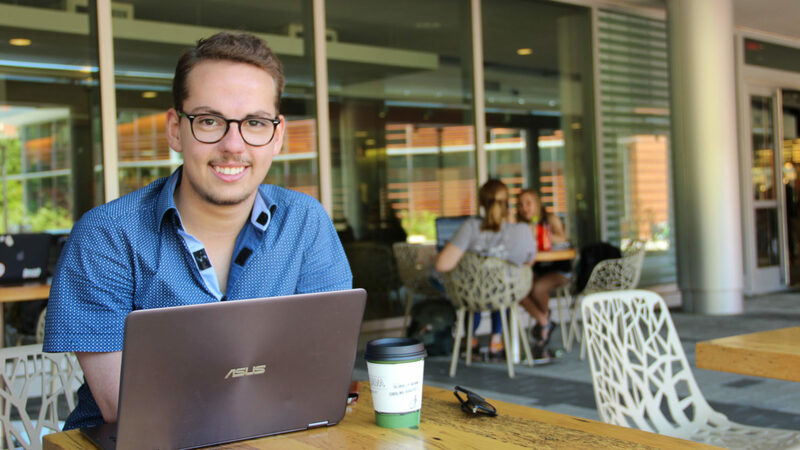 He is an international student from Germany, but calls Raleigh his second home. He grew up with a physical disability, and now works to create inclusive environments for all. He faced struggles adapting to the workload of American higher education, yet has maintained a 4.0 GPA. He is a natural leader, constantly seeking to share the credit. Patrick embodies the heart of NC State’s commitment to educating and empowering students to change the world for the better while utilizing their unique talents to contribute to the Pack. After growing up in Tuttlingen, Germany, Patrick came to NC State in 2016 to finish the last two years of his undergraduate career as part of the Poole College of Management’s International Business Dual Degree program. Patrick will graduate with a Bachelor of Science in business Administration with a concentration in entrepreneurship and honors in business analytics. Patrick will also receive a bachelor’s degree in international management from ESB Business School in Germany. Patrick founded and served as president of Digital ShapRs, a student organization dedicated to educating students on the complex nature of artificial intelligence and other digital innovations. He was also involved in the Society for Politics, Economics and Law (SPEL) and NC State’s Student Government. Patrick completed internships at SAP America, as well as bookingkit and Miller & Meier Consulting in Germany. Following graduation, Patrick will join Google at the company’s European Headquarters in Dublin and plans to further explore potential entrepreneurial ventures that allow him to follow his passion for public speaking and public policy. We sat down with Patrick recently to get his perspective on life here at NC State as he prepares to address the typically extraordinary class of 2018. You studied in Germany for two years before coming to finish at NC State. What led you down that road? The Poole College of Management collaborates with a number of other business schools through the International Partnership of Business Schools, IPBS. Through that partnership, Poole and my German university offer the International Business Dual Degree (IBDD) program, through which a student like me attends university in one country for two years (Germany in my case), and a second country (in a second language) for another two years. As soon as I looked through the choices, I knew I wanted to end up at Poole. It’s been amazing. Describe your experience as an international student at NC State. I recall looking for a printer on my first day here. I didn’t have my student ID yet so I couldn’t print. Walking around Nelson Hall, I met Dr. Jeff Pollack, who would later on teach me, and he told me “I don’t know where a printer is but just email me your documents and I’ll print them for you.” That is a testimony to how nice and welcoming everyone has been and how open the community is to international students. That said, being so far from home is not something that is always easy. When I first arrived here – my first day – my wheelchair broke down…I didn’t particularly get off to a good start. But since that time, I have grown more and more fond of this place. It really is a second home. And, I just love how open-minded and innovative Americans are, with that “let’s figure it out” mentality, no matter how big the problem may seem. That’s something I find to be very cool. As a famous German poet once said, “there are two hearts beating in my chest” at this point. The think and do mentality that I’ve been gifted here at NC State is something that will stick with me wherever my path leads me. What impact has your experience at Poole College had on your personal and academic life? I think a major part of who I am right now is due to my experience in Poole College…but also specifically individuals I have met here. Rob Sandruck, director of Poole’s global programs, has just been amazing. He organizes and tries to find structure in the chaos of international partnerships. Also, Professor Lewis Sheats from my entrepreneurship program has become a role model for me in the last two years simply because he does some things I find to be exceptional both for a professor and for a person…he goes above and beyond for his students. He supervised a thesis that I was fortunate enough to write for my German university, and he basically did that in his free time. He has been just one example of what I think makes Poole so amazing…the investment of professors, staff…everyone wants students to succeed. How has NC State shaped your future career choices? I have profited from NC State, especially the think and do mindset. In fact, that helped me a lot during my interviews with Google. One of the skills that big tech companies, but also consultancies, look for is that problem solving mentality. We are in an age where we are confronted with so many challenges that exceed what we can comprehend. One of the core skills is going to be that when confronted with challenges, we can think through the implications of the problems and then fix them. Just dive in and find solutions. The think and do mentality that I’ve been gifted here at NC State is something that will stick with me wherever my path leads me. Let’s talk about your club Digital ShapRs. How did that come together? The spark that ignited the idea of the club occurred when I interned at SAP. I was fortunate to work with some highly seasoned consultants on emerging topics from artificial intelligence to quantum computing to blockchain to machine learning. I learned a lot and also noticed so many other students just as curious. But there was not a club at NC State specifically dedicated to those topics. I began by assembling my executive board, which are three close friends of mine. I work with them every day and have been fortunate to have them on with me. We were very passionate and set a goal of bringing in, during our first semester, highly seasoned speakers. I think we accomplished that. Our first event was about the blockchain with one of the SAP solution center blockchain experts that I happen to know. He came in and he talked about the blockchain, and I think we had (at our first meeting) about sixty people present – which was mind-blowing. Through the club, we want to focus on helping members better understand questions like “What is a blockchain?”. We have had some amazing discussions, and the plurality of ideas that came from our student members has been something that has helped all of us learn an incredible amount. You are interested in emerging technologies… but you have also mentioned a passion for public speaking. How do those intersect? When you talk about artificial intelligence (AI) or when you talk about the blockchain you can’t just discuss technological infrastructure, you also have to be ready to discuss societal implications. At the end of the day individuals are attached to those new technologies. When you talk about AI, you talk about the truck driver who is danger of losing her job. Or when you talk about blockchain, you talk about ensuring that musicians might finally be fairly compensated for the beautiful music they create. So as future business leaders, it is more important to think about the people who are attached to these topics and ensure we engage in a discussion around how to provide for people who will be affected by technology. You are speaking at the university commencement ceremony. Are you nervous? I still sleep at night so far…will see if that changes as the day gets closer! It is an incredible honor to have been selected. The pressure is definitely on. I just heard the other day that about fifteen to eighteen thousand people will be expected in the PNC Arena. But I’m very excited. I feel like my personal story is something that can ideally inspire a lot of other people. And that is going to be the underlying theme of my speech…The idea that you have to transcend your own borders in order to achieve your own goals no matter how insurmountable the challenge ahead. My goal is for graduates to leave the commencement ceremony and this institution with the ultimate will to pursue whatever they want to pursue. We will see how it goes! What will you miss most about NC State? The people. Definitely. I’ve made so many friends here over the last two years. With social media it is easy to stay in touch, but the physical distance is going to be tough. Also faculty and staff…and (Howling Cow) ice cream. As good as European or Italian gelato is, I’m going to miss the ice cream here. This is a place where it does not matter who you are, or where you come from, or what you believe, where you are supported to achieve your goals if you are dedicated and willing to try your best. That is at the core of NC State University. What is your favorite Howling Cow flavor? Chancellor’s choice. That one is my favorite. He clearly knows what he is doing. Thirty years from now looking back: What kind of difference do you hope to have made? I think ever since I was a small kid I have adhered to a set of principles that I want society to live by. Everything that I do is supposed to contribute to the greater mission of making this world a place that is more just and more open for everyone. Having grown up with a physical disability, I have experienced both severe social injustice as well as extraordinary commitment aimed at remedying it. Thus, I am a strong believer in creating inclusive, individualized environments that provide the same opportunity to everyone. Kind of my own version of the American Dream. So, I will want to look back and have inspired people to pursue their individual hopes and to make the most out of themselves. What does it mean to be a part of the Pack to you?